The ground-breaking New York death metal veterans are back with their 10th full-length. As always the band delivers a solid effort filled with tunes of a quality most young acts can only wish for. Admittedly, 'Atonement' does not reach the monumental peaks of legendary albums such as 'Dawn of Possession' of 'Failure for Gods'. 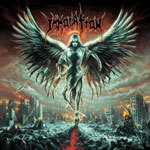 Still though, Immolation deliver an album worthy of their legend.